Howard Alden is one of a handful of up and coming guitarists bringing the seven string archtop guitar to the forefront of jazz in the tradition of the legendary George Van Eps. His prowess as a single-string improviser is daunting and his insight into fretboard harmony and chord construction is second to none. Born in Newport Beach, California in 1958, Howard began playing guitar and tenor banjo as a child. Alden's early influences were Louis Armstrong, Barney Kessel, and Charlie Christian. He later developed a passion for the harmonies and textures in the music of Bill Evans and Thelonious Monk. In 1982 he moved to New York City where he still resides. 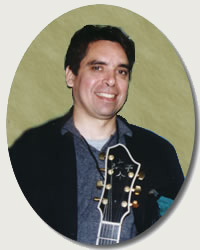 Howard Alden was voted "Best Emerging Guitar Talent" in the first annual Jazz Times critics poll in 1990 and "Talent Deserving Wider Recognition" in the '92, '93, '95, and '96 Downbeat critics polls. In November 1997, Alden performed at the opening of the world famous Chinery Exhibition at the Smithsonian Institute's Museum of American History. He continues to challenge his creativity by performing in different instrumental combinations and settings. This book features the Django Reinhardt style guitar solos played by Howard Alden on the film "Sweet and Lowdown". Songs include: "I'll See You In My Dreams, I'm Forever Blowing Bubbles, Limehouse Blues, Wrap Your Troubles in Dreams, Just a Gigolo, Sweet Georgia Brown, Unfaithful Woman, "E" Is For Emmet, Shine, 12th Street Rag, 3:00 AM Blues, It Don't Mean a Thing (If It Ain't Got That Swing), Old Fashioned Love". Howard Alden Plays "I'll See You In My Dreams"
Howard's musical depth and instrumental mastery are clearly apparent in this concert recorded at the Smithsonian Jazz Cafe in Washington D.C. on January 27th, 2006. Jon Burr on Bass and Rob Garcia on drums join Howard on a rich selection of jazz favorites, with the beautiful voice of Terrie Richards Alden on "Gone With the Wind". Songs include: "My Shining Hour, Dream Dancing, I'm Forever Blowing Bubbles, The Peacocks, 64 Bars on Wilshire, Tears, Simplicidade, The Single Petal of a Rose, Le Sucrier Velour, Forty-Eight, Tango el Bongo, Gone With the Wind, In a Mellow Tone, Isfahan, Melancholia, Dancers in Love, Cotton Tail". George Van Eps & Howard Alden Play "Night & Day"
Howard Alden Plays "Limehouse Blues"
This exclusive collection of Hank Mackie solo jazz guitar arrangements features 170 of Hank's best guitar pieces written in block chord diagram form for the fingerstyle guitarist! Hank was featured in the August 1998 issue of "Just Jazz Guitar" magazine. His piano-like arrangements are in the "constant motion" style of George Van Eps and feature lots of walking bass lines, moving inner voices, chord substitutions, and re-harmonizations! These beautiful Hank Mackie solo guitar arrangements can now be purchased individually, allowing you to "hand-pick" which songs you want to learn. These are the full-length versions of each song exactly the way Hank performs them at upscale restaurants. Exciting, challenging, sometimes even daring - and absolutely stunning!